Swiss Lvx Hæresis was formed three years ago and self-released a nine-minutes single in fifty copies in 2015. Two months ago, the band's first full-length work was released digitally before the CD was released the following month. The quintet plays a mighty occult form of black metal, where the ritual performance ooze with bottled up anger, aversion and disgust. Strap yourself in, for it's going to be turbulent. The hypnotic nature of the music beats me unconscious and practically renders me speechless. 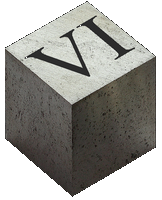 Again I start on song I, moving via II - III and onward through one and one Roman numeral before the sixth song VII rounds off Descensŭs Spīrĭtŭs after about 47 minutes. Frozen fingers rest lifeless over the keyboard, still motionless while the album ebbs out. The consciousness seems to be put out of action, while the subconsciousness has simply resigned. Two buzzing guitars and an equally thundering bass creates an unholy resounding trinity that resonate with and open portals to otherworldly dimension. The drums are at times calm and rhythmically steady as you sink deeper into the hypnosis, but when you open your eyes you are surrounded by dark clouds of thunder. As dazzling lightning and its rumbling thunderstorm detonate simultaneously, you notice the rickety mine cart you are in and the unsteady rails underneath. When you start rolling, you realize that the starting shot has already been fired, well aware that the acceleration is just getting started. The tempo of the drum reaches a glowing crescendo, but sinks, waves and alternates with a will of its own. Beastly distorted roars breathes down your neck and chase you through lashing rain and ice-cold headwinds while the wheels rattle and rubs against rusty rails on mouldering railway sleepers. But the music isn't running away out of control. It is controlled like perfected spontaneity. You wake up again in another allegorical scenario created by the hypnosis. The music thrums steadily, calmly, but with nuanced ebbs and flows and a strong ominous feeling. Faceless marionettists are pull the threads. You are a puppet trapped in a certain atmosphere, caught in a timeless moment. Will this never end? Where will I wake up the next time and to what dreadful visions? An eternal bouldering sonorous timbre of constantly vibrant and vibrating strings fills your sphere while the echo of a red-hot, guttural, heated and judgemental voice reprimand you, and hard threatening warlike blows reminds you that you are no longer in control and that there are no means of escape. Again, the music finally fades out, and you find yourself dazed just where you were when you initially took the plunge into nightmare-inducing Descensŭs Spīrĭtŭs. And before you reach full awareness, you've already acquired a ticket for another spin. Excuse my fumbling attempts at conveying the frenzied unreal ethos of Descensŭs Spīrĭtŭs, and take the dive into an alien netherworld whose exquisite sound comes courtesy of V. Santura. French-Canadian Neige et Noirceur released a nice album only last year. The time has obviously come to compensate. 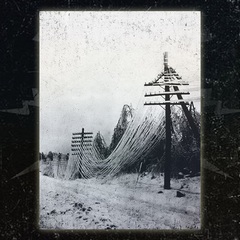 Like other Québécois métal de noir bands, this one-man band tended to mix moody cold atmosphere with necrotic black metal, but last year's Les Ténèbres Modernes moved in a completely different direction. It was the band's most flaming and warlike release, but now the flame has burned out, and in the sulphuric ash, there's not much more left than a surplus stock of rather useless fire-damaged ambiance. 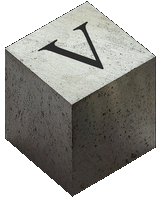 Verglapolis consists of six songs, where maximum half the material works without impressing all that much, while the rest just gets on my nerves. The song L'hiver de force remains a lone favourite. That despite it spending almost three minutes just getting started. After a meaningless ambient start, elements of black metal are eventually incorporated. With great amounts of goodwill, one can say that the distorted soundscape carries similarities to Slagmaur. The cold and hostile atmosphere does the trick nonetheless. The song Pluie verglaçante et brouillard de glace offer a somewhat similar experience, with resounding ice winds and saddened rhythms. Not too bad. 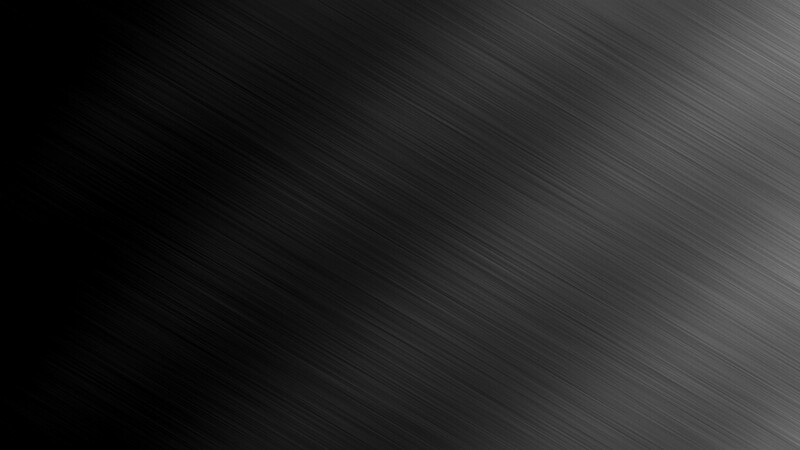 Énergie noire becomes an intermediate between the black metal ingredients and the folly I'm soon coming to. There's a lot of cacophonous noise here, and little substance. The first half of Le monde est une forêt noire is filled with synth-like avant-garde sound effects, and in the last half this is mixed with thin and strangely scrambled guitar and slow pace. A bit moody. A bit boring. But not as bad as Nordet / Les premières neiges, that spends over seven minutes on droning, deafening and highly meaningless ambient sound collages. The biggest nightmare, and not in a positive sense, is nevertheless Ruines électriques. This utter rubbish consists of over 12 minutes of sounds. Bad ground meats transformer noise meats old modems and fax-machines meats defective liaison equipment meats runaway frequency generators meats white noise and so on. People who actively listen to such nonsense garbage should seek out someone who sell pharmaceuticals on the black market and get something against their advanced psychosis. I quite enjoy some of the moods, but that's far from enough to justify purchasing Verglapolis. Ofermod entered the Swedish black metal scene in 1996. The EP Mystérion Tés Anomias (1998) gave them some attention, but it was the debut album Tiamtü (2008) that really placed them on the map with its cleverly structured diabolical melodies. The sequel Thaumiel (2012) at times had a touch of older Norwegian black metal, but not quite as good melody lines in my ears. In addition, some songs felt somewhat repetitive. However, the album had lots of variation from song to song, and the sound was obviously more professional. I observe that there's many who rank the two albums the other way around, and both recordings are solid enough to have gained some thing of a cult status. Sol Nox in one way follows a bit in the footsteps of its predecessor, but still stands out a great deal. The music is still characterized by a suggestive (upper) mid-tempo drive with a touch of monotony that gives a ritual feel, but the production is warmer, more burning this time. It sounds more aggressive and Swedish. Maybe even with a whiff of Greece. The substance of Sol Nox is somewhat limited, as this is music that pounds away in an unstoppable manner, but Ofermod incorporates ample nuanced variation that creates enough ripples to keep the listeners' attention. Surely, there's not a hell of a lot going on here. The flame burns steadily and looks like flames tend to to. But fluttering flames are always in motion, as always creating a fascinating spectacle. And the resounding black flame darkens the mind with toxic smoke. It's been taking some time between Ofermod's releases, as main man Michayah Belfagor (Nefandus) has been repeatedly in and out of jail. In addition to guitarist Michayah we find Tehôm (Mortuus) on vocals and guitar, Rudra (ex-Nefandus) on bass and Simon S. on drums. An in every way competent gang. Sol Nox has become a good record. I personally have more of a liking for this than for Thaumiel, but it should be said that I haven't heard that one quite as many times as I ought to. (I'm perhaps a tad incompetent.) This is nevertheless not a remarkably eventful album. Sol Nox offers a semi-hypnotic mood, and don't let go of the listener through its lightly flickering and somewhat ceremonial chain of events. The songs are primarily not very distinctive, but they ain't identical either, and each song has its charm. The song Sun of Dead Seasons was an early favourite, and the wonderful melodic riffing still allows it to keep the lead with a decent margin. The album spellbinds with the many shades and nuances of rhythm and riffs, and when you've first gotten started, you'll want to sit the whole thing through. The atmosphere drags me as a listening further and further into the hypnosis during the journey, and Sol Nox therefore gives an artificial feeling of becoming gradually stronger towards the end. Warm and rich production also fits into this occult mass, as the heat makes you dull and drowsy, receptive to hypnotic suggestion. Although Sol Nox is not entirely mandatory, this is black metal with nice punch, which works well at a high volume. Give the album a few spins if you have the opportunity. 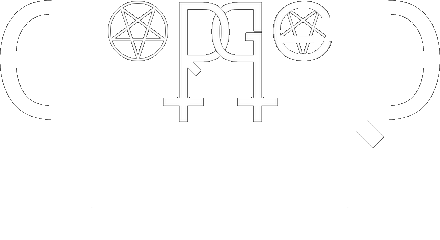 For now, crank up opener The Alpha of the Antichrist. Acherontas continues their spiritual journey started on Ma IoN (Formulas of Reptilian Unification). Throughout three quarters of an hour, meditative hermetic suggestion with roots planted in the Hellenic core, is again conveyed. With Amarta अमर्त (Formulas of Reptilian Unification Part II), Acherontas celebrates 20 years* by embracing traditional solar worship, as well as revolting against modernism, compromise and trends in a crowded scene characterized by the lack of legitimate satanic spirituality. *Vocalist and guitarist Acherontas V.Priest started the band Acherontas in the ashes of the band Stutthof ten years ago. In total, as the press release states, that's 20 years, but Acherontas is not a direct continuation of Stutthof, and V.Priest started up as musician more than twenty years ago. 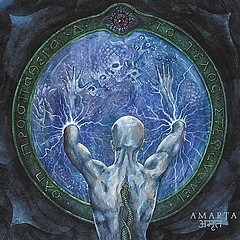 Amarta is yet another good release from Greek “veterans”. (Although the band is only ten years old, most members have lots of experience.) The music again appear as a swirling atmospheric snake den. However, I don't get the same strong sense of immersion as I did with the predecessor. Not to say that the band is going on autopilot. They have probably put their souls into their new work, but it just doesn't hit the same nerve that Ma IoN did. I don't quite understand why the band don't captivate in the same manner this time around. It might have something to do with the expression. Ma IoN had a more occult, doomy and devilish expression with lots of dynamism in the lively material. Amarta feels somewhat more flat and straight forward. This work lasts for less than 50 minutes, which is normally easier to swallow than over 70 minutes, such as the predecessor. However, it had plenty of breathers in the form of ambient shamanism. The album played on a wider range, and these contrasts underlined and intensified the diabolical aspect of the black and extreme segments. अमर्त is an alright release, by all means, but the songs don't grab me in the same way. They don't speak to me. Not until Savikalpa Samadhi and the subsequent title song comes along. The last two songs, and the two longest. There is no law of nature that implies that longer songs should be better, but like a self-fulfilling prophecy, they tends to be just that. I think there's an elementary connection behind this. I guess most bands either write long tunes when they have many different riffs and passages that slide together and create a larger coherent whole, or try to make more out of an already long song by constructing more intricate dynamic substance and implementing more varied structures. Subjective reasons might be the only reason why yours truly and Acherontas ain't entirely on the same wavelength during the first 30 minutes. But then the drugs begin to take effect, the ice brakes, the conversation flows smoothly, and the last 15 minutes fly by in the blink of a heartbeat. I think that's barely enough for a weak four points. In the region of the Catalan, the devil rule the land. Or so it may seem, based on Atrexial from Barcelona in northern Spain, an area that has long wanted to detach itself from the rest of the country. The three diabolic alchemists seem, already with their very first release, to have distilled the essence of death metal and black metal, and forged an alloy of these in the very flames of Hell. 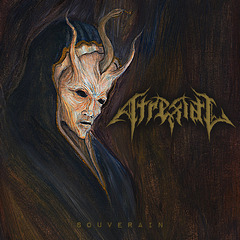 Atrexial is a debutant worth noting, for Souverain is possibly the best debut of the year. 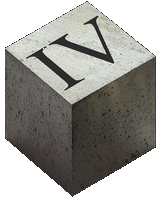 Souverain, or sovereign in English, is hardly merely a title, but just as much a statement or a manifesto, for “superb” is the immediate feeling I get when Atrexial goes to war. The band gives the expressions “mixed emotions” and “mood swings” a new meaning with its successful fusion of different moods in a rock steady hybrid of two genres. Souverain opens with horrific sounds that gives a feeling of taking part in a very creepy movie. The album amongst other offers a theatrical sense of horror movies. This is due in part to some clever symphonic sequences and interludes, as well as the use of devilish samples. In this case, the Devil is not the friend and supporter of mankind, Lucifer, but Satan, Hollywood's biblical charmer and the one that devours your soul through infinite suffering. A fictional character created by allegedly well-meaning souls. The atmospheric orchestral ending of The Ominous Silence makes me think of Apotheosis from the tiny Republic of Malta, by the way. When black disgust and death's aggression meet for a head-to-head duel, unimagined fatal forces are unleashed. 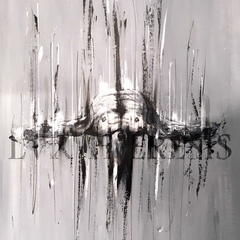 Fear, strength, sorrow, anger, pride, pain, power, and powerlessness are all emotions whose animalistic fumes have put their mark on an almost hour-long work exhibiting copious details. All of these feelings are, however, only to be regarded as perceptible screams from tormented souls in purgatory. What dominates most is the roar of hell-fire. Coal black furore and frenetic grotesque fatality creates a maddening pummelling impact of resolute satanic thrust. An entire hour can be a lot to absorb, especially with all the delightful details this album hides, but it's nothing compared to eternity in inferno according to Dante. Slight crackling in the sound is the only thing I choose to nitpick about, although it doesn't really bother me notably. The reason for these debris are probably clipping due to somewhat hefty compression. This, however, isn't particularly notable in the soundscape. Maybe because the music is not as intense as the striking drumming can create a credible illusion of. One could always point out that all the samples may give this type of vehement extreme metal a fairly unserious dramaturgic expression, but I think most of them fit in. Besides, a touch of unpretentious blasphemous devilment only befits the blazing profanity. Flaming riffs, bestial guitar work, diabolical atmosphere and tastefully integrated segments with sophisticated fiddle-strings and grand piano are among the elements that immediately and instinctively made me fall for Atrexial's debut to begin with. After a dozen hours, the effect of Souverain has not deteriorated, but rather grown to a proper firework from Hell. 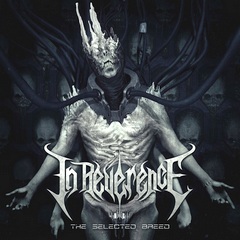 The trio In Reverence is yet another newcomer. The debutants have been around for seven years, though, and released both demo and EP early on. The guys apparently started out with deathcore, and most of those involved have limited experience. I assume that the band has matured in these years. By now they play negatively charged death metal and impress abundantly. The lyrical focus on The Selected Breed revolves around humanity's tendency to self-destruction, and leads us through various stages and scenarios associated with this irreversible fatal demise. The Swedes' death metal is a powerful diet, with moderate exotic undertones and an underlying ominous atmosphere in anticipation of the apocalypse. Drawing small parallels to Nile and Melechesh doesn't feel entirely unnatural. In Reverence doesn't use ingredients of the Middle East to the same apparent extent, but a few strings of Oriental origin is used as spice. Frequent enough to become a significant part of the expression, but without stealing the attention. It took some time to identify these as saz and santoor. The latter has a special timbre that can give some associations to the Norwegian langeleik or perhaps the Finnish/Karelian kantele, to compare with something from my region of habitation. All of these also belong in the same instrument category (dulcimer / zithere). I also get some associations to harpsichord, a stringed instrument with keyboard frequently used in the Renaissance and Baroque, but I guess that might as well just be me. The band had a lot of turnover in the early years, but soon stabilized as a trio. Among the involved, only one seems to have relevant experience from other orchestras, though not until later years. Drummer Oscar Krumlinde plays in the promising black metal band Avslut, which I have to keep an eye on. Otherwise, Pedram Khatibi Shahidi handles guitar while Filip Danielsson grunts his cataclysmic tidings. The trio has otherwise hired Joakim Antman from Overtorture, another band that Oscar is part of, as bassist, and Joakim Mikiver (One Hour Hell, Tormention) as guest vocalist. They've then entered Wing Studios with veteran Sverker Widgren, who has also mixed and mastered The Selected Breed. The sound is massive and juicy like raw beef. Determined and vigorous percussion and rich guitars reverberates in the ether. The album doesn't overstay its welcome. 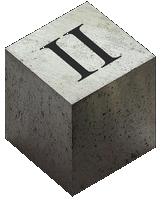 In Reverence finishes the job concise and effectively in less than 34 minutes. For me, it's only natural to play the album again at least once more as soon as the last acoustic tone fades out. Listen to The Sixth Bloodletting below and go to YouTube to see the lyric video for Prometheus. Full stream available under the attached video. 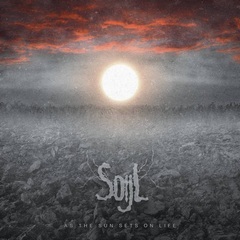 The mournful and melodic Swedish death/doom band Soijl is back with their second album. As mentioned in connection with Endless Elysian Fields, the debut released in the fall of 2015, the band was created in 2008 by Mattias Svensson, while Henrik Kindvall became part of the band the year before the debut. During the 20 months that have passed, drummer Malphas (Onda Makter) has also joined the band. A lot is unchanged, and if you appreciated the debut, you'll presumably like this one too. The style has not changed. The band performs heavy and grief-stricken death/doom with ditto growling, and the two albums sound quite similar, i.e. loud and clear, but heavy, deep and resounding. The new record is a few minutes longer than its predecessor, but both contain seven songs that together clock in at about the hour. As with the debut, I get some associations to My Dying Bride, albeit without the similarity becoming too apparent. Despite heavy riffs, the music has a hovering atmospheric ethos. Wistful melodies give the music wings. But gliding flight and majestic vistas give no comfort. The golden eagle's brave tears fall on a lush landscape that slowly fades away, consumed, poisoned and deteriorated by the greedy two-legged breed, which in unquenchable desire unceasingly increases its territory. Every single song has strong melodies, but I miss a proper heavy-duty riff or melody or two, that would truly stick as cattle branding. Endless Elysian Fields had the killer-song Dying Kinship. As The Sun Sets On Life “only” has seven equally good songs, soaked in lead and melancholy. For fans of death/doom that should nevertheless be enough.